What Internet is today is all because of social media sites. They help us to be in touch with our loved ones even when they are thousand miles away. In this big ocean, Facebook itself contributes more than 50 percent and it is one of the most used website. It has billions of active users. Winning users heart is no different from a turtle and rabbit race where the smart one wins. In the same way, there is a great competition between Facebook, Twitter, Instagram and other similar sites. Although Twitter is the second most popular social networking site but still many people hates it, even I was one of them. Did you know why? Comparing it with Facebook would be enough to point out the weak areas of Twitter. Here are the possible reasons for it. If we compare this case with Facebook then, it is far better. You can share long status, videos and photos. No matter what their size and length is. Apart from this, Facebook also provide notes feature which let you create long stories and good thing is, they are search engine friendly, means they are indexed in search results pages by Google or other search engines. This 140 characters limit is one the major reason why some people hate Twitter. At least, they should increase this limit to 500 characters. We use social media sites to be in touch with our friends, family members and colleagues. Almost all of our friends are on Facebook but are they on Twitter? Definitely not. So why to use those social sites which none of your friends uses? It would be of no use and we should remove "social" word from such sites. On an average, around 30-40% of your friends would have account on Twitter. Out of which only 20% will follow you. Although anonymous people can also follow you but it would have no value unless you're an artist, politician, athlete or any other celebrity. Active users are those which are active or online. 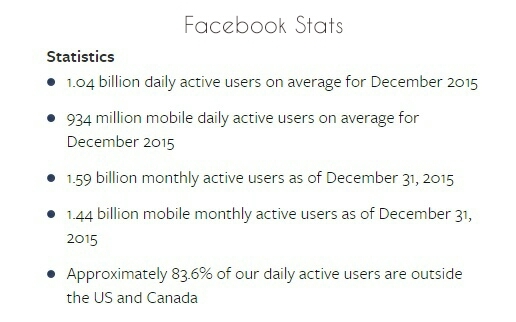 According to Facebook news room report, they has 1.59 billion active users per month which is around 1590 millions. 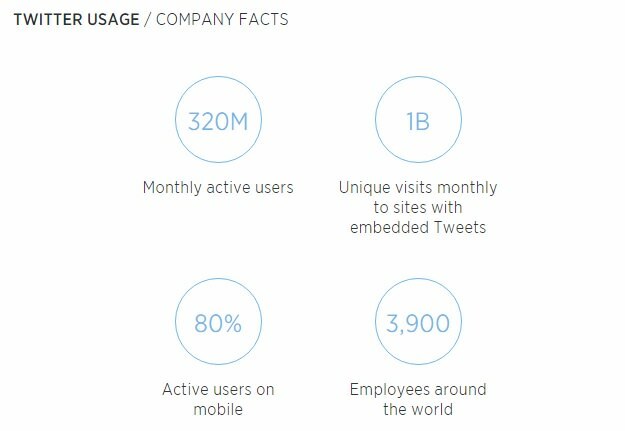 On the other hand, Twitter company report shows that they have 320 million active users only. There is a big difference of digit. If you know the basic maths, you can calculate that Facebook active users are approximate 5 times more than Twitter. This data is of 31 December 2015. Summing up all these points, we can say that Twitter has very less active users and due to this reason the organic reach (non-paid traffic) of tweets are very less. As already mentioned, around 30-40% of your friends would have account on Twitter but did they ever use it or comes online? No. So this is another reason why people don't use it. You can't check the history tweets. For example, you can't see what the person had tweeted 1 year back. In case of Facebook, you can filter profile posts with year basics. There is no option to customize news feed preference. Although Twitter has Highlights feature which let you see the most interesting stuff from the day but you can't set these news feed preference manually as like you can do in case of Facebook. Moreover, this Highlights feature is currently available for Android users only. Spam is everywhere online. Spammers target people with the help of social media sites and Twitter is the one of best place for them. You'll get direct message, mention or tag with spam links. Once you're trapped, you'll start following unknown people. You'll tweet, re-tweet and message spam links anonymously. This chain goes on and on and may trap your friends or followers also. Twitter report says that they have 320 million active users. Out of which few percent comes under spam users. If you'll look at the account of Barack Obama (undoubtedly, the most followed person), you'll find that he is following unknown people and this all is out of his control. In the same way, some terrorist groups also uses Twitter to target people. Although Twitter has taken major steps against this but still, thousands of fake accounts are created daily and it makes Twitter a little spammy somewhere. That's one of the reasons why people hate it. 6. One account, one user! In case of Facebook, you have one personal profile and can create any number of pages/groups within same account but this wasn't applicable for Twitter. In order to create a business page, you've to create a new account with new e-mail address. This is another big headache. Although you can switch different accounts easily on mobile app but on desktop version, you've to logout and login again to manage more than one account. 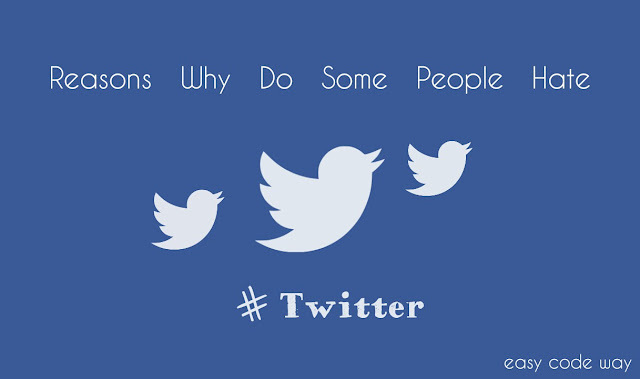 Here are few more reasons why are equally considerable and are the major drawbacks of Twitter. Less control over settings - Twitter users have very less control over account settings. Moreover, there is no extra security to protect user privacy. Twitter doesn't bring new feature - Some people hate Twitter because it doesn't bring new feature. There is hardly a little change in their theme after a long time. On the other hand, Facebook always introduce new features. Last week they had launched live videos. Moreover, Facebook also have separate mobile apps. For example, Lite app for those who have slow 2G Internet connection and Mentions app for verified accounts. There is no privacy for tweet reply. When you'll comment on any tweet, it will be posted on your wall and anyone can see what you had replied. These are some of my personal views on Twitter. If you've any question or wants to debate on this topic, please let me know in below comment box. You can also join me on Twitter @MeVivekCh as well. Is there any other weird thing that you hate?